Clicking on clips or recordings in the SnapStream Web Interface does not start playing back automatically like it normally would after updating to the latest version of Firefox. Firefox started blocking autoplay by default with a recent FireFox update. 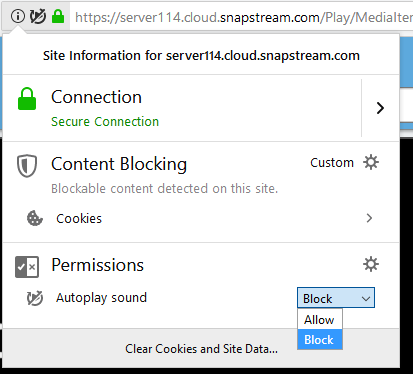 To set FireFox to automatically play content from your SnapStream Server gain, start by trying to play something back in SnapStream. When it doesn't automatically start playing, click the play icon with the slash through it to the left of the address bar. Then switch the Permissions for Autoplay sound to Allow.